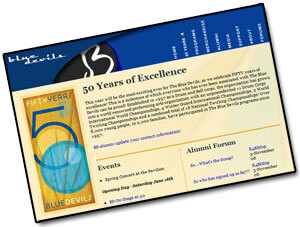 Blue Devils has launched a Web page dedicated to the celebration of the organization's 50th anniversary in 2007. The page has a list of anniversary events currently scheduled for the 2007 season, history of the organization, online forums for alumni discussions, and more. Check it out at www.bluedevils.org/50.